It is probably the only eyelash serum that comes in an intensely pink cardboard box. This is what makes Dabalash eyelash enhancer different. The bottle is standard, light grey, decorated with the brand’s logo and a shiny stripe under the cap. It isn’t an elegant product but still may appeal to some women. The design is okay but how does Dabalash eyelash enhancer work in practice? Read on to learn about the effects and application. The effects are visualised through a short equation on the website of the product. 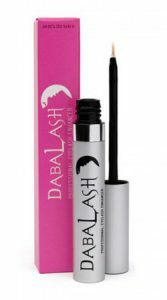 Dabalash eyelash enhancer plus short and brittle lashes equals long, healthy and beautiful eyelashes and eyebrows. It is a typical eyelash growth product. It visually boosts volume, it can thicken and slightly strengthen your lashes from the roots. Unfortunately, it is one of the serums that fail to deliver comprehensive action. Nevertheless, Dabalash Serum is a good option if you want to give your eyelashes the definition. Before the application, you must remove make-up and all impurities from your face. Once the skin is dry, apply the product. Dabalash eyelash enhancer has a standard brush used for spreading the serum along the lash line. Remove the excess of the serum from the brush to minimize the risk of getting the liquid inside the eyes. The rules are the same: you can apply make-up after the serum is absorbed; you must use Dabalash Serum regularly, every day. The larger capacity is not the only thing that makes this serum different from others. The information on the packaging saying the product is unisex is more striking. Men can use the serum, which usually doesn’t seem to work. The formula is paraben-free and scentless.